5 Acres & A Dream: Preparedness For What? There's a lot of hoopla about preparedness these days. Some folks are preparing for the end of the world as we know it (TEOTWAWKI), while others don't see the point. I suppose it depends on how much confidence one has in the government, economic system, and those who run them (or fight over who runs them). It's no secret that Dan and I are on the no-confidence side of the fence, but I honestly have no idea if or when the system will collapse. That lack of confidence is one of the reasons we choose to homestead (the other reason is that we love it.) But also, we have experienced months of joblessness and no income, plus natural disaster which has left us for days without electricity and water. It was only because we took steps to be prepared for situations like these that we were able to stay warm, clean, and happily fed. Consequently, our experiences have caused us not to just focus on preparedness, but on self-reliance. That's why I was glad to see this book included in the PrepperBundle, Keys to Successful Homesteading by Scott M Terry. Some of you may be familiar with Scott from his Christian Farm and Homestead Radio podcasts. I've been on his show a couple of times and can tell you from experience that Scott is extremely knowledgeable about all aspects of farming, homesteading, and agrarianism. 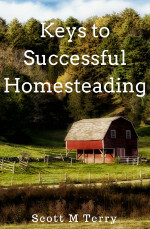 His book is probably one of the most practical books on homesteading out there. He doesn't give you details on things like how to plan a garden, how to build a chicken coop, and what kind of critters to get; rather he tells you what other homesteading books omit, i.e., the bottom line make-it-or-break-it stuff that is only learned from years of observation and experience. What he teaches you is how to have the proper mindset, realistic expectations, and make good choices. These things don't come naturally in the modern world, which is why this book is highly recommended. But what if you aren't able to buy some acreage and homestead? What if you can't rely on self-reliance? 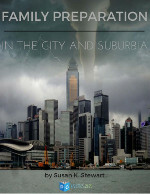 Then this is the book for you - Family Preparation in the City and Suburbia by Susan K. Stewart. It covers everything a suburban home or apartment dweller should be concerned about: water, heat, food, lighting, medical, money, entertainment, education, employment, protection, and community. Includes printable forms to help you with situation assessment, electricity assessment, and a document tracking system. 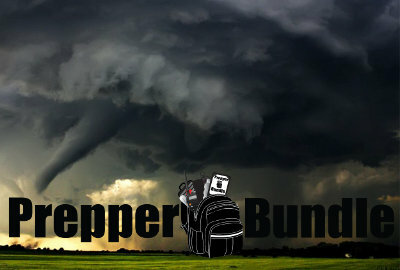 To see the list of everything that's included in the bundle (PDF eBooks, videos, courses, and bonus offers), check out my "Introducing the PrepperBundle" blog post. In addition to all of those, if you purchase the bundle through my blog, I'll give you an eBook from my The Little Series of Homestead How-Tos collection - your choice for free! After you place your order simply email me at 5acresandadream @ mail. com, let me know which one you'd like, and I'll email you a link to download a free copy in the format of your choice. Online access to downloadable PDFs: $29.97 (That's a 90% savings over buying each title individually). USB thumb drive version only: $54.97 (portable and won't disappear if your computer dies). $1 of all purchases will be donated to veterans' charities. Questions? I'll be happy to answer them! I remember the Ice Storm of 1998. I lived in an apartment in downtown Montreal and it was traumatic not having power, heat, water or safety for a week in January. Since then I've been slowly preparing myself for a survival situation. Alex and I will continue along this path when we buy. I'm not into the end of the world as we know it, but I do like the song. ;) I don't think the world will explode or become distopian-like in my time, but the more prepared you are, the better peace of mind you have! That's practical preparedness and you are so right about peace of mind. Sometimes I think sometimes it takes a difficult situation to drive home the need for personal preparedness. The other thing I discovered about being prepared, was that I was able to help others that I ordinarily wouldn't have been able to help. My surplus was a godsend for them. Nancy, at one time our government encouraged every family to be prepared for an emergency. The FEMA website (back in the 1990s) had checklists of recommended supplies needed per person for things like wheat, rice, beans, water, etc. Then after Y2K I remember Bill Clinton saying there was no need from preparedness because the government was able to handle it all. So those FEMA lists are long gone and some people do indeed trust in the government. Practically speaking, however, folks who have experienced some of those large-scale natural disasters know how difficult it was for government help and normalcy to arrive. I think it just makes sense to do what we can as individual citizens. Like Rain said, it gives peace of mind. I'll have to check and see if Susan's book is available independently. I know for the Back-To-Basics Bundle, many of the books were exclusive to the bundle, which is a shame because it's a lot of good information. I'd have to say that her book is the most thorough I've seen for folks in urban-type situations.